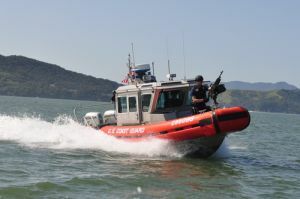 The Coast Guard will establish a temporary security zone in designated waters of the National Capital Region for the State of the Union address Jan. 25, 2011. During this period, security zone enforcement may limit or prohibit navigation by commercial and recreational waterway users. The security zone will include the Potomac River from the Francis Scott Key Bridge, U.S. Route 29, down to Potomac River buoy number four, approximately one mile north of the Woodrow Wilson Bridge from shoreline to shoreline. The security zone will include the Georgetown Channel Tidal Basin as well as the Anacostia River from the CSX Railroad Bridge down to its confluence with the Potomac River. The waterways will be closed to recreational boaters from 4 p.m. Tuesday to midnight. Commercial boaters may be allowed to transit the security zone at the discretion of the Coast Guard. For vessels seeking authorization to enter or transit the security zone, contact the Coast Guard at 202-767-1194 or via marine-band radio on VHF channel 16.